Twister dug up an actual review of Wing Commander Armada from Power Unlimited dated from December 1994. That'd have been days before Wing Commander 3 came out. I don't know what you'll think, but I found it a fun read. In expectation of Wing Commander III, where Star Wars-star Mark Hamill will have a lead part in, let’s go into space once more whit the CD version of Wing Commander Armada. Fight or be conquered. What was going on in the Wing Commander Universe again? Somewhere in the 27th century an earth scout ship stumbles upon a few Kilrathi warships. These Kilrathi are beings who have been conquering worlds ever since they made the discovery of space travel. The same goes for the humans, but they use treaties and diplomacy. Anyway, soon after the humans are at war with the Kilrathi, the stakes; the ruler of the universe. Stand together to fight a war on your own isn’t usually much fun. The people at origin got understood that. Every possible Multyplayer option has been put on this CD including, split-screen, null-modem, modem and network. Together against the enemy, or against a friend. The only minor is that when playing split screen the screen shows space only and leaves the cockpit out of the view. This may seen dull, until the enemy comes into your sighs. From there on you’ll hardly miss the cockpit, because the panels look nice and all, but actually only block your view. Build to fight instead of just fighting in space, Armada offers you the option to conquer planets as well, to use for mining. You can use the resources to build spaceships whit which you can fight your opponents. This offers a welcome change of pace in the game instead of the non-stop blasting. Still, The only purpose to this is to expand your fleet. It’s would have been fun to have some sort of colonisation option here, the goal in the game isn’t to win as mush planets as you can, it is destroy your opponents mother ship, and this is, unless you have another human opponent, only fun for a few times. Good graphics, nice sound affects and simple controls. But it’s noting more then a shoot 'em up, a nice shoot 'em up, let’s not deny that. Definitely worth the effort if you can play over modem or network. If you have to play this alone it won’t be as satisfying as the rest of the series. Now I think I figured out what I like in the article, the beginning sounds more like an official promo for the game than a review. Zachari Monty reports. Climactic changes have wrought havoc on Crius, as ice caps have melted following global warming. 65% of the planet's land mass has been bathed in warm water, and the problem has been compounded by the deluge over-running the Gleamco detergent factory, resulting in the largest bubble bath the galaxy has ever seen. Young children are said to be particularly upset with the state of affairs. Purification planets are working triple shifts in an attempt to avert ecological disaster, and a huge surplus of Fresh Water has resulted, good news for any traders in the stuff. Jacek Kwiatkowski found a large Wing Commander feature in the Polish gaming magazine CD Action. In their June 2000 issue they apparently review the Wing Commander universe and touch on its fans. The CIC got a mention as well. If anyone can scan a copy, transcribe the feature or otherwise obtain this magazine, please let us know. The July issue may be at stores now however, so keep an eye out. TC found a forum post at 3D Action Planet about a Wing Commander drinking game. We ordinarily don't highlight these types of posts, but it's as well written as some conventional articles out there and would probably be overlooked otherwise. For a short silly little diversion, click here. Jack Hogan noticed that SciFi.com will be hosting a special "Battlestar Commander" trivia game as one of its Mindprobe features. On July 19 there will be a combined Battlestar Galactica and Wing Commander contest. A special prize is to be announced. You can find more here. Battlestar Galactica and Wing Commander -- two great themes that taste great together! OK... so they don't really have anything to do with eachother, but here they are for your trivia enjoyment. Everything from Apollo, Starbuck and the Cylons to Maverick, Maniac and the Kilrathi war. Wing Commander will be showing on the United Kingdom equivalent of Pay Per View, Sky Box Office, starting July 17, 2000. It will be £3 per view and should be rated "PG." Thanks to Peter Batten. This is another opportunity for those in the UK to see the movie since it never did show up in theaters there as far as I recall. Recently 3D Action Planet produced a feature that highlighted the worst space sim games ever. Somehow Wing Commander took half the slots. Privateer 1 is a "mediocre" spinoff, the Midway should've been "MUCH bigger" and Secret Ops doesn't even have music or speech according to this guy. It's good for a laugh. You can find the article here. Thanks to PopsiclePete. I've been occupied with workstuff for the past four days and I'll be at UW for the next couple days, so Week 80 Trivia will be extended a week. It seems to have been a moderately difficult set of questions, so maybe some people will be able to look up a few more answers. 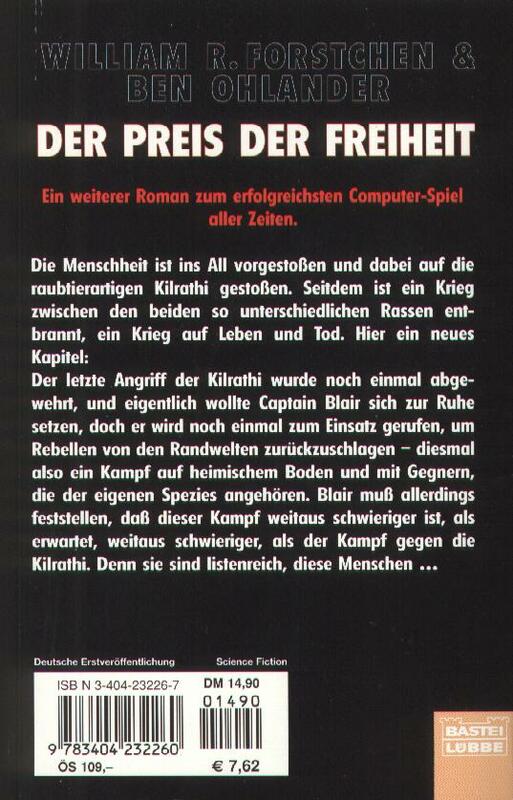 The backcover of the novel, kindly scanned and sent in by Markus Steinkamp, confirms that Der Preis Der Freiheit is indeed The Price of Freedom, even though a few things indicated otherwise. The title of the next German novel up for release, Die Bedrohung, suggests it is False Colors. 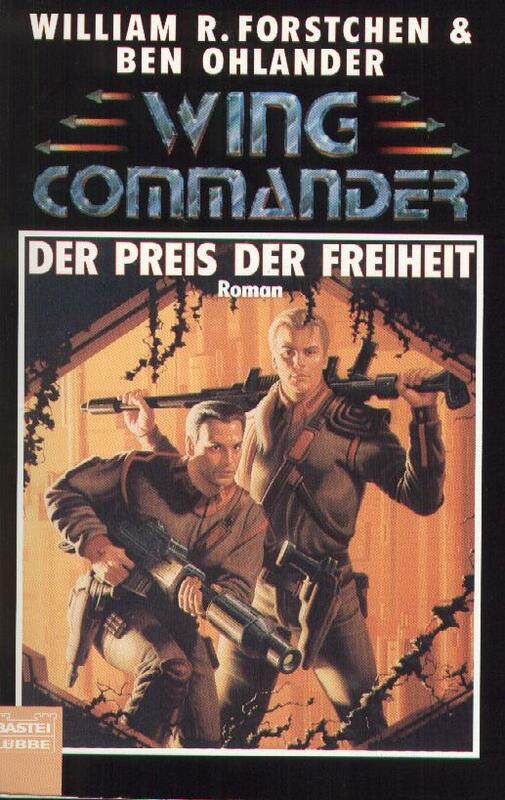 But the German translations have followed the original publishing order this far, so it could still be Action Stations. Only time will tell. For now, here's that backcover. 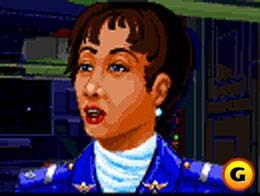 Any Wing Commander veteran would expect the Roberts' trademark in mission design, the open-ended nature of missions to be an integral part of the gameplay. Great visuals, fantastic frame rates, high intensity action... It's Chris and Erin Roberts damn it! Like most reviewers, this one was left out of the loop. You can read the article here. Quarto and Matrix extracted and spruced up a memorable scene from Wing Commander 2 and made an animated .gif of it. In about 250 k you can see a wonderful clip of the Concordia taking out a Fralthra with its Phase Transit Cannon. Makes you want to take a fighter out and go help yourself. Margaret Dunne graciously reminded us that we neglected to mention the results of A Talent For War's poll about gamers' first space sim experience. Not surprisingly, Wing Commander topped the list. The full results are below. Their current poll asks about the upcoming game Terminus. Which was your first space sim experience? What appears to be the German translation of "The Price of Freedom" has been released in Germany by Bastei Luebbe. There have been questions raised about which story is actually told in this novel. For example, the number of pages reported would seem to indicate this is False Colors. But we'll now know soon enough. Been a while since we've reported about a brand new shiny Wing Commander product hitting the shelves, so this is nice (does KS WC1 included with PC Gamer count?). The ISBN number is 3404232267 and you can find the Amazon.de listing here. Thanks to Markus Steinkamp who has been following the German novel translations for quite some time. But that's not all! Bastei Luebbe has announced that it will also be publishing Die Bedrohung (Action Stations I would guess). It should be out this year. The half-dozen German novels released so far would sure make great collectors' items.. Similar to their preview, Federation HQ is of the belief that Starlancer is the continuation of Wing Commander. In their review, the author begins with quite a few reflections back on WC, then goes into a number of mediocre issues he has with the game. And I generally don't find it to be a good sign when the reviewer calls 1024x768 resolution a hindering limitation in a game. But to each his own. You can find their review here. Sawq reports on a very interesting fan project he's involved with. They're making themselves a CGI movie by throwing cutscenes from games like Prophecy, Starlancer and Freelancer in the mix. The first result is a 4 minute trailer, which you can download here. They're hoping to release the full, hourlong movie titled "Space: Hell" soon. You can view the trailer with Windows Media Player, but you'll need the DivX plug-in. You can grab that here. Rodent Show Could Be Suspended! Pet correspondent Rachel Domusa reports. There are scenes of despair here on Hermes, as the organisers of the System-famous Cleft's pet show face up to the fact that the event may have to be cancelled for the first time in its 50 year history. The problem lies in that participants from all three systems have had great difficulties in transporting their Fluffy Rodents to the show thanks to a transport shortage. Any freelance cargo shipper who can assist will be well rewarded for their efforts; all you have to do is pick up a shipment of Fluffy Rodents from any participating planet, and process them through the Hermes trading interface as usual. The French company Kalisto has annouced it has just signed an agreement with Daylight Productions. It will be renamed Kalisto USA and continue work in San Francisco and Austin. Daylight was founded by Mark Day a few years back. He was a producer of WC games from WC3 through Prophecy. They made the DVD version of Wing Commander 4 and the unreleased Prophecy DVD. A number of other WC veterans, including composer George Oldziey, were also part of the company. You can find the press release here. TC dug up the direct link at PC Gamer's website with information on disk replacment. If you're one of the people with a damaged July PC Gamer cover disc, you can find help here. It takes them a couple weeks to get the replacement there. And my keyboard is broken, so excuse my especially substandard writing today (pasting u's and other keys in is rather annoying). Gagco. Enterprises presents their latest piece of tomfoolery... the Kakotron 2000.Ideal for stag parties, office bashes and just plain old practical joking, the Kakotron 2000 is the ultimate in high tech japery. Simply point it at a friend/enemy/dube and press the button... special Kakulator beams will shoot out, rooting the victin to the spot with instant paralysis. Now you can inject the victim with our patent Kakolene, allowing you to mould his face into the most hideous apparition you can think of. But hurry! Kakulator beams only last for a few minutes, and you can bet your whoopee cushion that the victim ain't gonna be too happy! The Kakotron 2000 form Gaco. Only 500 credits. A few people have reported about the cover discs of the July PC Gamer being defective. Apparently a number had manufacturing problems. I'd recommend going to the Support Shelter if you're having trouble accessing the disc. On a related note, yes, the Canadian version of the magazine includes the disc as well. TC got me a copy of the cover too. With a cover like that it'd be kinda bad if Canada didn't get the disc..
Daniel Schwager told us that Lancer Games is sponsoring a Starlancer tournament later this summer. It sounds kinda interesting, I might give it a try. Here's what he had to say. My name is Daniel Schwager and I run the Lancer Games Network. We are currently sponsoring a Star Lancer Ladder Competition. Registration runs until July 4, 2000 so everyone will have 1 month to register. Once that happens, Lancer Games will begin the competition. Players will enter in a general match for the first round, then after round 1, they will be placed in either Ladder 1 or Ladder 2, depending on where they placed in their battle. Ladder 1, first place, prize is a $50 dollar gift certificate to Electronic Boutique. Ladder 2, which is the second place bracket. Once players enter their respective bracket, should they be defeated in either placing, that is it, they are out of the tournament totally. The rules page can be found here and the registration page is located here. Today the July issue of PC Gamer should be available to buy from stores. It includes the Kilrathi Saga version of WC1, along with a number of other old games. People who have the subscription service have confirmed the Secret Mission addons do work with this version. You can find more information here. Note that the most recent cover I could find, above, appears to be of the June issue. But hey, it's got UO2 in big letters.. Coincidences never cease to amaze me..
Rick Salemi noticed Jeremy Roberts was featured on the new Sci Fi Channel series "Invisible Man." Roberts played "Gash" Dekker in Wing Commander 4 and Prophecy. They'll probably be replaying the show soon, so keep an eye out if this character is one of your favorites. The OmniComfort Endosystem, with full waste reprocessing, adjustable temperature control, MicroBar and AR on-line entertainment suite. Eight pre-programmed 'Outfit' modes plus the option to customize your own styles. Automatic Designer updates every 4 weeks, plus a 20% discount on future improvements. Psych noticed that we missed Steele releasing or fixing several Wing Commander models for X-Wing Alliance. The TCS Lexington, TCS Victory, Murphy Class Destroyer and more are available. These are definitely worth checking out if you have XWA. And if you like him, send him a note of encouragement so he keeps up the great work. You can reach him and the models at www.steele-aerospace.de. Iridium let us know that CNN just released their review of Starlancer. It always makes me curious when they review a game. "Space combat has never looked better" according to them. Okay. The best part of this article is probably seeing Wing Commander in print at a notable non-game site like CNN. The worst? They think it will keep everyone busy until Freelancer comes out in a year. You can find the review here. Hey, maybe we should still review the game. If it's not too late for CNN..
Says Howard Napkin, mouthpiece of decency. Psychotic architect Zimzam Edific has once again inflicted death and misery on unsuspecting innocents. Disaster occurred on Bex at the site of Zimzam's latest project, a rollercoaster constructed completely of glass. Work having finished two days ago, the maiden ride was scheduled for this morning; 185 young orphans, 13 terminally ill patients from the local hospital, the Mayor and his pet dog Spanky all climbed aboard the glittering capsure in good faith, cheering with anticipation. Twenty seconds later, the once mighty rollercoaster was little more than a pile of glass shards. Casualties are high.....Medi Kits are urgently required. We've got a little bit of a news backlog to cover over the next few days, and up first is Gamespot's latest TenSpot list. Sometimes they're hit and miss, but they have a real winner this time. Quite a few people noticed Mariko "Spirit" Tanaka was recognized as one of the top ten most outstanding female characters of all time in a computer game. They've written up a nice summary of her role in Wing Commander. She's my most favorite female WC character, and apparently many have the same feeling. The feature begins here and you can find Spirit's page here. There's also a ballot to vote on your own favorites. I Wish I Could Draw Like Jeff K.
LOAF noticed Jeff K. from Something Awful made a comic a few weeks back about Origin's renaming of Ultima Online 2. If I stretched I could probably find a neat connection to Wing Commander, but it's mainly just a funny critique of Origin. You can find the comic here. Deathball commentator Sangwyn Juspen reports. Greetings, Deathball enthusiasts everywhere. I'm here at Aorta Park, home to the legendary Gritlet Chainsaws, where the Chainsaws have just set a new league mortality record against arch-rivals Rascon Axemen. Gritley have looked strong all season, and their form came to a head today: five seconds after the kcik-off, eight Rascon players were either dead or fatally injured, while one Gritley plaer had sustained a slight scratch to the left arm. When the full time whistle blew, the score was 11-0 to the Chainsaws, with 43 Rascon players dead and 103 injured. 6 Gritley players were injured, and none at all were killed, the largest difference ever recorded. PC Gamer Disc Editor Jeremy Williams confirmed for us today that their July issue cover disc includes twelve classic PC games. Some of them are pretty hot and some of them I've wanted to try for a while. I'm actually rather excited to pick this one up soon. The issue should hit newsstands by June 13. They've also set up a Support Shelter to help people run the older games, although that shouldn't be necessary for the included WC1, since it's the Kilrathi Saga version. The first Secret Missions package, available in the Files section, should also work with the PC Gamer WC1. You may have noticed we've been stretched a little thin lately. Most of us are in various stages of finals or other grueling unhappy activities right now, this week especially. I'm graduating tomorrow though, so things like Trivia and such should be back on schedule soon and next week I should be able to update things like the Fan Directory. While we have so far been unable to confirm this ourselves, numerous people have reported finding WC1 on this month's PC Gamer magazine (US edition). It is believed to be the Kilrathi Saga (Windows) version, which means the possibility of it coming with the two Secret Missions add-ons, or the downloadable add-ons being useable with the CD. We'll update when we receive more information. Have You Ever Wondered What Human Flesh Tastes Like? Your palate is jaded... you've tried the finest foodstuff the galaxy has to offer, and yet you're still looking for the ultimate taste sensation. Well, now your search is over! The Long Pig Company present for your delectation Real Human Flesh! We've taken cell samples from the tastiest people alive, and vat-grown synthetic copies of their flesh. Now you can tuck into a big plate of real person... without the CIS coming a-knocking on your door! Real Human Flesh. Only 25 credits a kilo. Comco reports that the 3D Group in the process of getting together has a considerable amount of support so far. Of note in this update is their forum. 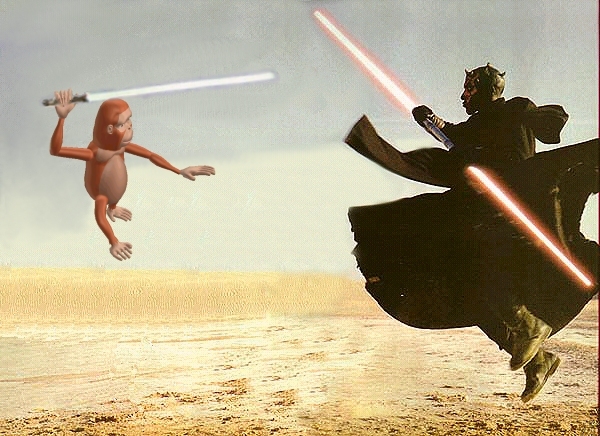 If you'd like to see what's going on currently, point your browser to www.scifi-art.com/forums. You can find our previous update here. Hopefully the weather's as nice where you are as it is where I am. It's almost hard to stay indoors. The sun appears to have taken its toll on a couple of our regular trivia players this week too. If you've haven't played yet, Week 78 answers are due tomorrow. And if you've never played before, now's as good of a time as any to start. Question 155: What system was home to the Korah Pokh Listening Station? Question 156: What system was home to the Achilles Mining Base? Bonus 78: What system was home to the Trojan Four Shipyards? Jeux t'aime presents their new smash hit boardgame - Hammer Hilarity! The rules are simple; roll the dice and take your go. But watch out for the Hammer square! As soon as someone lands on it, everybody goes mallet manic, trying to knock out their opponents with one of the supplied Manley Hydraulic Hammers. Guaranteed fun from Jeux t'aime. 'The Masters of Mirth' Hammer Hilarity, 175 creds from all good gaming booths. One free Medikit supplied. The WC games featured no-nonsense flying, shooting, and blowing up of enemy things. In a word: fun. Mixing in excellent gameplay with cinematic storytelling threw the player into the environment and refused to let go. The original Wing Commander (WC), designed by Chris Roberts and Origin, was released on January 1, 1990 to critical acclaim. The release date for Wing Commander I mentioned in the article is most likely not accurate. We haven't been able to pinpoint an exact date yet. You can find the article here and the Wing Commander bit here. Thanks to WildFire-. As always, June is ace's Happy Month which means parties, celebrations, and people yelling "Happy AHM!" over at ace's Happy Chatzone. Head on over to ace-1.com and marvel at the wonders of ace's Happy Homepage! Now you too can own a home or habicube designed by award-winning architect Zim Zam Edific. Choose from one of these great locations! The Palm Oasis resort in the Peninsula of Despair, Hades. Watery Acres, Durellian Sea, Janus IV. Prices start at 150,000 credits! Now you too can own a home of distinction.